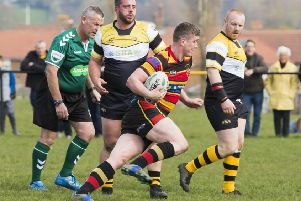 Rishworthians moved up to seventh in Yorkshire Two with another bonus point win in a 34-15 home win over Goole. They played some exciting rugby but at other times they made heavy weather of it and looked vulnerable in defence close to their own line. But this was outweighed by a good performance which might have netted at least a couple more tries. Rishies got off to a great start with some fine running rugby. A dropped pass spoiled a move which might have brought a try, although they got their points almost immediately. A clearance kick was fielded by left wing Anthony Shoesmith, who linked with fullback Matthew Hunt-Brown. He off-loaded to centre Taniela Bakoso, who put No 8 Andy Shickell in on a strong run to the line. Joe Billing converted. Soon after Bakoso linked with fellow centre Kurt Sutcliffe, who sold an outrageous dummy before dashing to touch down in the corner. Goole pulled back three points with a penalty, but Shickell almost scored again and was causing havoc in the visitors’ defence until he was yellow-carded for pulling down a maul. While he was off, Goole scored a try from a catch and drive, but Billing closed the first half with a penalty to give the home side a 15–8 lead. Rishworthians started the second half as they had done the first and immediately gained a five-metre scrum. The ball came out to Bakoso, who cruised over. Billing added the conversion. The hosts then seemed to struggle and were pinned down by the visitors. Eventually they broke out, led by Shickell and lock Fraser Swarbrooke, before Shickell finally put supporting flanker Richard Mervill over for the bonus point try, converted by Billing. Lock Nick Faulkner looked to have got over, but was ruled held up. From the ensuing scrum, however, Shickell picked up and crashed over in the corner for his second try. Near the end Goole hit back to force their way over for a consolation converted try. Rishworthians seconds won 55 – 0 at Huddersfield YMCA. Rhys Town scored five tries, Will Illingworth got three and Josh Illingworth added another, with Josh Kelly kicking five conversions.